Solid fuel stove & full central heating, Flexible sleeping layout, raised dinette, spacious bathroom, walk in full sized shower. Exceptionally well maintained. Steelwork & Fit-out – Steel by G&J Reeves. 10mm Baseplate, 6mm Hull sides, 4mm Cabin sides and roof. Fit out By J. D. Boat Services (Gailey) Ltd.
Gas Locker & Well-deck – A gas locker mounted in the foredeck contains 2 cylinders. The well deck has fixed seats on both sides. A 100+ gallon Stainless Steel water tank is under the deck. There are glazed doors in the glazed steel bulkhead. 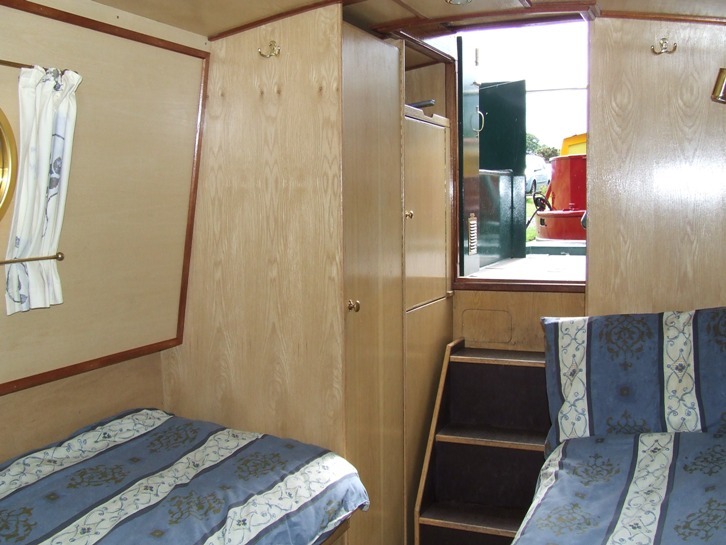 Saloon – The Saloon includes a Solid Fuel stove, a good sized TV cabinet with shelving, a raised height L-shaped dinette/settee for improved vision – which converts to a double berth bed with storage. 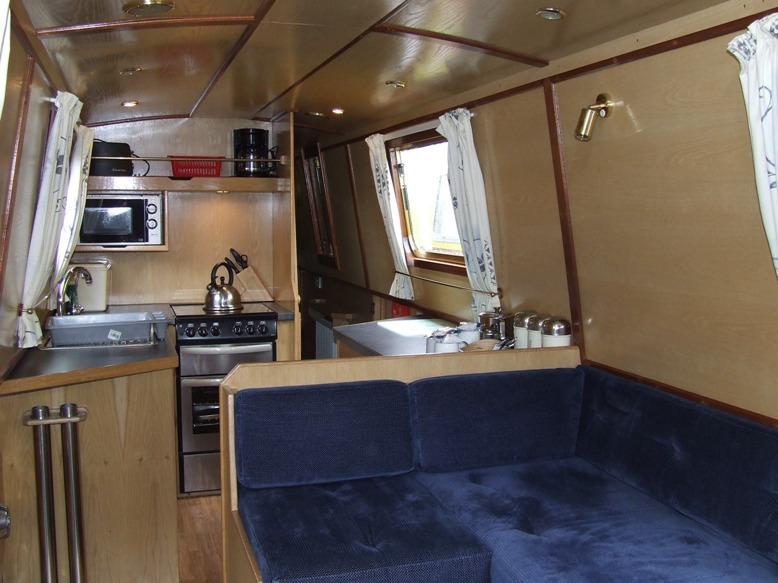 Galley – The Galley is a walk through type with good storage, 230V Refrigerator, LPG 4 burner hob, grill and oven. A 230V Microwave, toaster and coffee maker are provided. Main bedroom – Has a 6ft 5ins long fixed double bed with a shelf mounted over the bed head with reading lights mounted under, a good sized wardrobe and under bed storage. A pair of wood lined steel cabin side doors are fitted in the opposite cabin side for ventilation. Toilet compartment and shower – The enclosed Toilet Compartment has a full size Domestic Shower with a glass door, a wash basin with storage above and below, a Saniflo Macerator toilet with a 100 Gallon tank. A nest of shelves beside the shower gives useful storage. Surfaces are laminated for ease of cleaning. Privacy doors are set at each end of the passage. 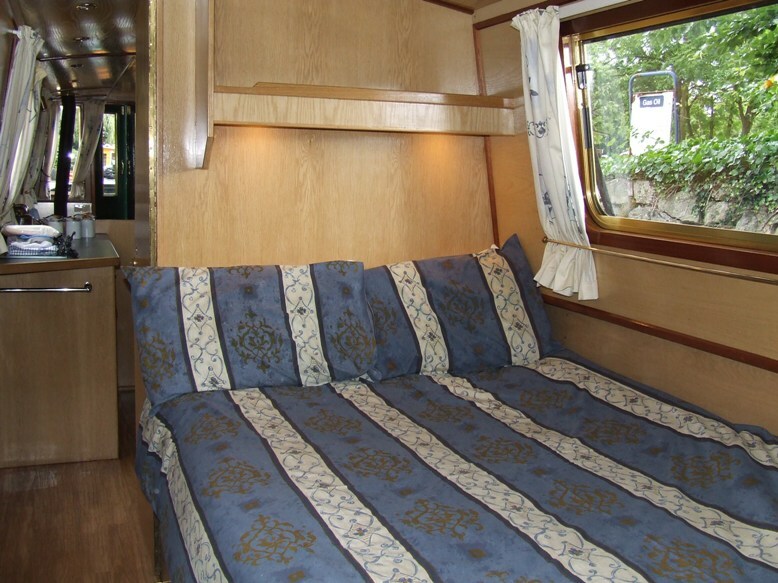 Stern Bedroom – This bedroom has a flexible layout which can be either a double berth or two single berths. The fabric covered mattresses are 6ft 6ins long. A shelf over the bed head has reading lights mounted underneath, under bed storage and a wardrobe are provided. 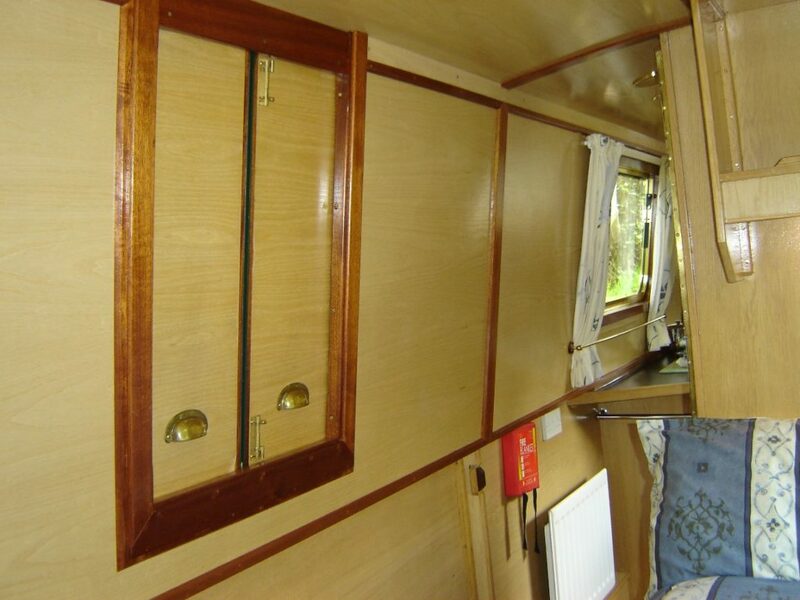 Steps, Wet locker and Airing cupboard – The electrical services are above the heated wet locker on the port side. 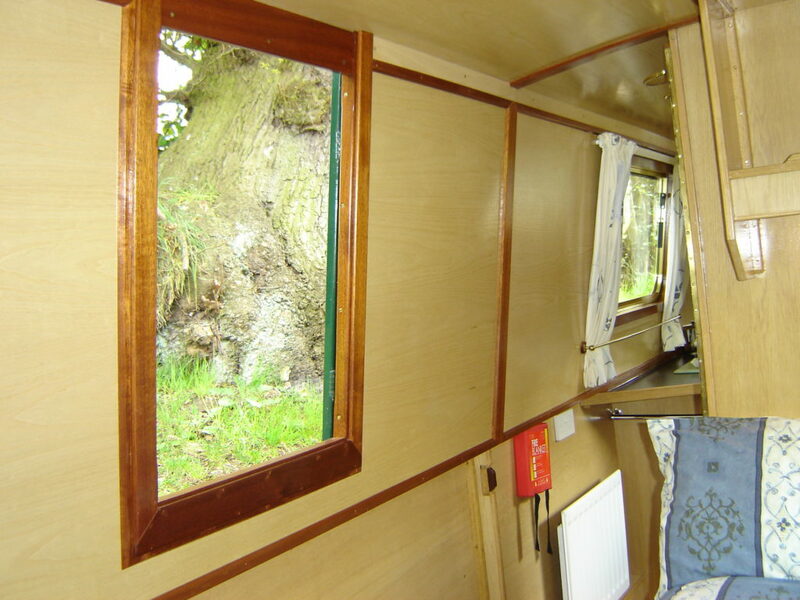 An Airing cupboard is located on the starboard side, with hot water tank and shelves above, A central door with three internal steps leads up to the inner rear deck, a roof hatch over provides easy access. Rear Decks – The stern is Semi-Trad style with seats both sides and the engine underneath. A tonneau cover covers the inner deck. An additional pair of outer doors separates the inner deck and the stern deck. There is a hinged access panel for the weed hatch in the stern deck. Engine – A four cylinder Shire 40 water cooled diesel engine and a PRM 150 gearbox with Python Drive are located under the inner rear deck. Electrical Systems – 3 separate battery banks are provided for engine start, cabin services and the Eberspächer boiler. The 230V A/C system includes a 3000w Victron inverter/charger which also has a shore line installed. Shared ownership allows you to take four weeks holiday every year onboard your narrowboat , whilst sharing the costs with other like-minded owners. These weeks are allocated as 2 weeks during the season (Mid Apr – Mid Oct), which have the same dates each year (see the chart below), and 2 floating winter weeks. Your 2 floating winter weeks (Mid Oct to mid April) are allocated by a bidding process, each owner submits bids for the weeks they would prefer and after a little “Horse Trading”, an amicable result is usually achieved quite quickly. This bidding process will normally take place in the Shareowners AGM. 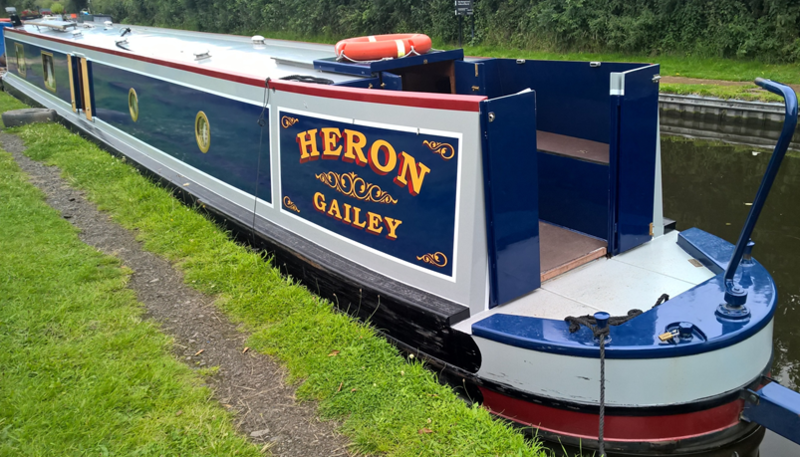 Although Heron’s contract states that owners can pick her up on Sunday mornings and return her on Saturday mornings, invariably we usually have her ready to pick up late Saturday afternoon. Management & Routine Servicing – £255.49 Inc. VAT per Quarter year, per share. We provide the infrastructure of office work necessary to co-ordinate the smooth running of your shared ownership scheme, e.g. : issuing invoices and collecting moneys due, organising moorings, C&RT licence, boat insurance, providing facilities for boat servicing & maintenance, and any other matters that may arise from time to time. This also includes fix cost items such as your share of the Insurance, Licence, Moorings at Gailey, working hours breakdown service and 24 hour Emergency breakdown cover. Routine servicing and check over is carried out at the end of each holiday. The costs of replenishing fuel used and emptying the Sewage tank at the end of your holiday will be charged to each owner by invoice. A cleaning service is available after each period of use at an additional charge. Owners group – Ongoing Maintenance Fund. As it is impossible to predict maintenance costs accurately, we advise each Consortium to appoint a Treasurer who will control a fund into which the owners contribute payments to cover future expenditure. This is usually discussed at the owners AGM. This fund is managed, collected & distributed by the Owners group. This is to cover wear & tear as it occurs, from small items such as replacement bedding to major purchases such as replacement engine or full repaint. Gas cylinders are replenished when the boat is serviced and the cost charged to this fund. Money paid into the Maintenance fund is left behind if your shares are sold, new owners take over the contributions, but can rest assured that some funds are already in place to cover wear & tear sustained prior to their ownership. What happens at the end of the share contract? At the end of the 10 year contract the share owners have a choice of renewing the contract for another period of time (which a lot of our previous share schemes over the last 24 years have done), or selling the boat and splitting the proceeds between themselves. Heron’s contract expires Feb 2026. During the 10 year period it is possible to sell your share if you should need to.